The inaugural ceremony of Kesshet -2016, the 4th edition of cultural Fest of the Asian Education Group culminated in style. This grand opening was witnessed by 28 colleges of Delhi NCR. The Guest of honour of this grand ceremony was Mr. Sumit Awasthi, Dy. Managing Editor of TV18 Broadcast Ltd. 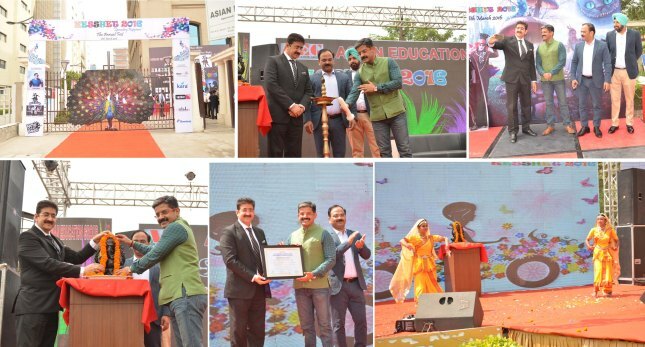 He was presented the Lifetime Membership of the International Business and Management Research Centre by Mr. Sandeep Marwah, Chairman, Asian Education Group along with Dr. Lalitya Vir Srivastava, Director, Asian Education Group and Mr. Gurdeep Singh Raina, Director (Admissions), Asian Education Group. The distinguished guests shared their words of wisdom with the students and announced the opening of the cultural fest –Kesshet 2016 with style.